Happy New Year to you all. It has been SOOOO long. I started a new business and was so busy I had to take time off from blogging. So much was happening I could not find the words to blog. I have missed you all and most of all I have missed visiting all the amazing blogs I have seen since starting my blogging journey. To start off the New Year I am in design mode. One of the designs I wanted to make more of are cards like the Tardis card below. 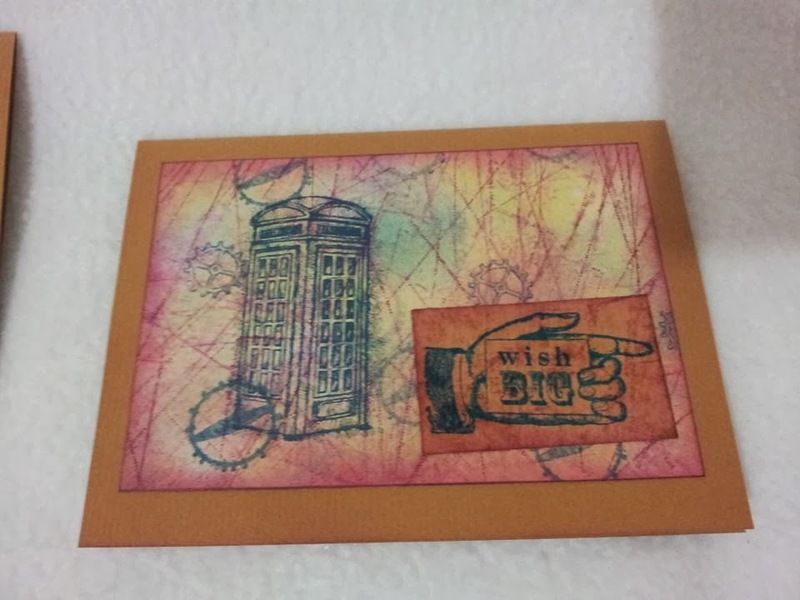 I have been creating cards like this using sponging techniques. I do a whole A5 page at one time. It takes me about 30 min to create one page. I happen to be watching a scrapbooking show I have recorded. 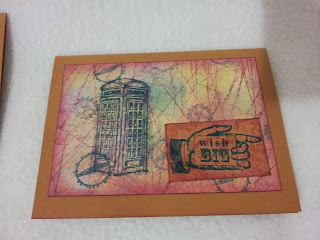 On that show they demonstrated a Gelli plate that is used for printing. The method they showed was sooo much faster than my sponging, inking, and masking. It got me thinking about how I could use this Gelli plate to create my card backgrounds. I went on a Youtube search to see how other's use this Gelli Plate. I found out that you could make your own Gelli plate. It is made of Gelatine and Glycerine. YES! Ok I love crafting of any kind and the challenge to make something rather than buy was on. 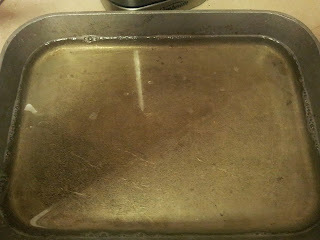 My first attempt the Gelli stuck to the pan...ick. 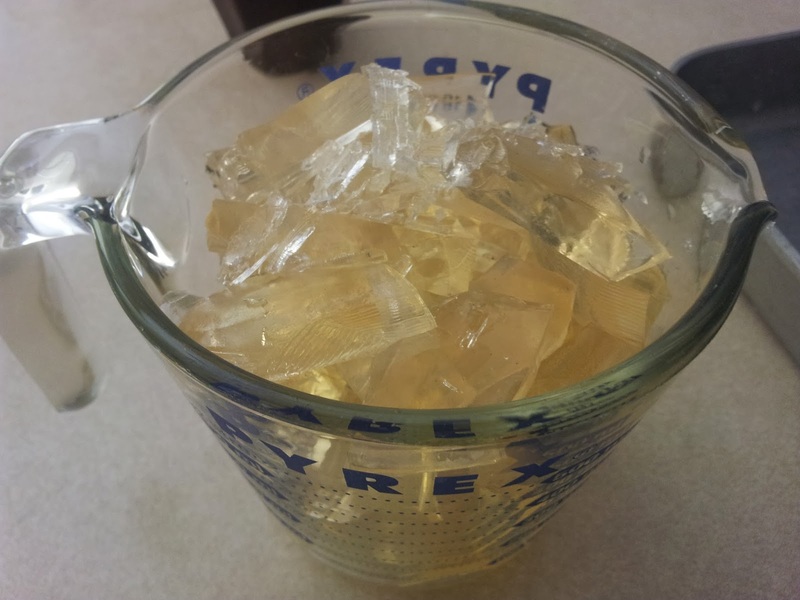 So I chopped it up and remelted it. Finally, I have a Gelli plate. Now for the design work. I am hoping I can get the same or similar effect as the Dr. Who card above. I have never heard of this, but then again I lack the crafty gene! Cute card! That is gorgeous. Love it. I wish I was this crafty. Thanks for sharing. Good luck, I hope it comes out just the way you want it! I hope your business will work great. Good luck! Very pretty card and what an interesting technique. Congrats on your Etsy business! I've never heard of a geli plate, but looks like you are good at your craft!